There are several things that set LMNO Arts apart from the run-of-the-mill landscape or art business. Exclusivity is one of them. Scott Lindberg and Cristie Thomas, the artistic power couple who are LMNO, run their company more like a private art club than a public business-relying mostly on word of mouth for business, and then scrupulously screening clients before working with them. They aren't open to the public; rather their large gallery of architectural and sculptural home and garden ornaments, which is also the backyard of their Aptos home, is viewable by appointment only for potential clients. Lindberg and Thomas require that these visitors come prepared. "We give them some homework to do to make sure they are actually ready to sit down and design," says Thomas. "We ask them to bring photographs of the site from all directions, and any photographs or ideas of other things they like, to give us an idea of who they are and of their style." This preliminary process may seem arduous at first, but it is the special ingredient to LMNO's success: working with clients who are "the right fit" allows the artists to create a truly customized, perfect piece. The two have become experts at determining people's styles in order to achieve this. They use the photographs the client brings in (of anything from their personal art collection or interior decorating to quilts or magazine cut-outs) and take in their style of dress, the car they drive, and whatever other things they can. After drawing a plan with the client, they then ask for complete trust and go from there-using metal, wood, concrete, and glass to create a one-of-a-kind bench, arbor, railing, awning, birdbath, or any number of items from their repertoire. "We want to make something that fits their lifestyle and also the architecture of their surroundings," says Lindberg. Though they say they have never made the same thing twice (even with fences and gates, which are their most frequent requests), some jobs are more adventurous than others. Their last project was a 50-by-2-foot 'House Necklace' for a woman who wanted a decorative, exterior piece to go between the first and second stories of her home. Not only was it an unconventional artistic endeavor, but the woman was also a perfect client to work with, helping Lindberg and Thomas to reach the best outcome. "The House Necklace client was ideal: adventuresome, creative, trusting," says Lindberg. "She had no problem telling us 'I don't like that, I like that.'" "Trusting, that was huge," adds Thomas, finishing her partner's thought. "She was also really positive and excited about everything." Lindberg and Thomas consider themselves artists first, and a business second. They started out as artists working in separate mediums, and moved into pottery after meeting. They operated in in the realm of ceramics from the '70s until the early '90s, when the itch for a career change became an inescapable pull, leading to the formation of LMNO Arts. LMNO Arts will be participating in Open Studios this fall, open to the public for the only time this year. For more information on the company, visit lmnoarts.com. Passages represents the first significant exhibition of Scott Lindberg and Cristie Thomas's combined cast bronze, fabricated bronze, steel, and wood sculpture. 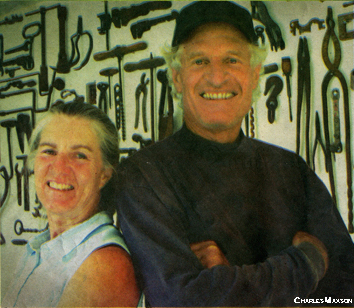 This energetic and creative couple created the work seen here together after a long history as artists. They began working in collaboration in 1976. And, like many of the great married collaborative artists and designers, such as Ray and Charles Eames, their work has developed into many different areas of industrial design and artistic expression. Although they are primarily fabricators, their work is profoundly influenced by many years of work in clay. Moving towards steel in 1992, they left ceramics behind completely in 1996. The clay work had the same strength of form and play on image, as is evident in the work of Passages. 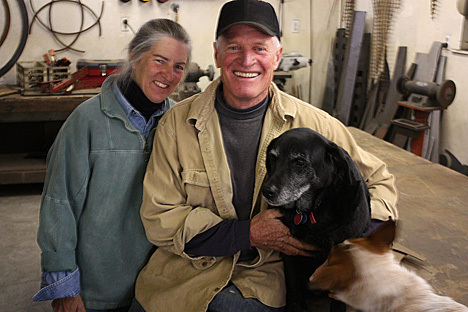 This Santa Cruz County couple focuses primarily on custom fabricated work for architects, landscape architects and designers. However, when they are free to develop their sculpture the approach is a playful consideration of strong forms and materials, always working toward a refined sense of elegance and tension. In these recent pieces, they are able to explore the fluidity of the bronze, juxtaposed against the hard edges achieved through fabrication and the softness of the wood. Scott and Cristie's shared passion for architecture and construction, combined with their love for gardening and the outdoors, inspire their work. And we suspect that their new passion for horses and riding will have an impact on work in the future. 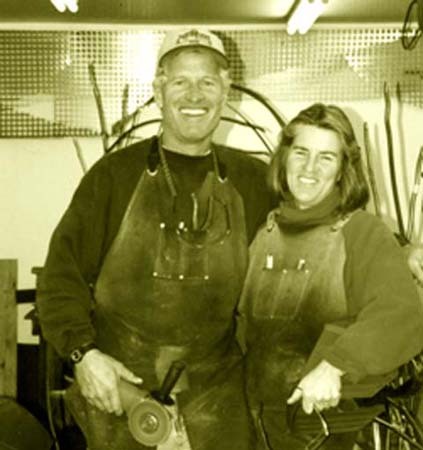 As entertainment, this couple began casting bronze at the Cabrillo College foundry in 2001. However their relationship with Cabrillo began many years ago as students in the art and industrial technology departments. It is with great satisfaction that we exhibit their latest work in the Cabrillo Gallery today. Wood, bronze and iron. With these three basic materials the team of Scott Lindbeg and Cristie Thomas have, over a period of several years, put together an exhibition of sculptures, "Passages," which is currently on display at the Cabrillo Gallery in Aptos. The materials are the basic building blocks of civilization, and the artificer team has given their innate quality of strength and solidity a chance to shine. The iron work, a specialty of the Lindberg-Thomas team in their business as well as their art, has a lightness, almost a delicacy in these pieces. The wood, worked from beams and posts, is carved in graceful arcs, and polished. The bronzes, some of which are cast from real objects such as seedpods, pears and pomegranates, are treated wtih natural coppery patinas. Each piece is a collaboration between the two artists. "The ideas come as we do the work," Thomas said. "We started with a number of small cast bronzes." They did the bronzes at the Cabrillo foundry. The wood came about when the pair had access to a wood construction yard. 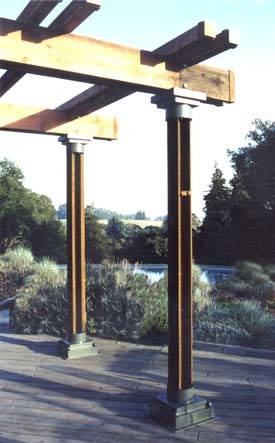 Steel fabricating came from their own facility, where they do custom fabricating for architecture and gardens. The constructions are mostly about 4 to 6 feet in height, and have a basic structure of wood or fabricated steel, with a bronze feature on the top. They have a sense of being cantilevered slightly off-balance, as if they were moving. The titles suggest a subtle playfulness. In "Pear Up There," a bronze pear in a wooden boat is supported by polished steel rods. "Fishbone Xylophone" whimsically describes the piece, a series of thin blades in a frame work of steel bars. "Pomegranate House" is a finely worked steel tower, housing four pomegranates, three of which are cast in bronze. Structure and material are not hidden in Lindberg/Thomas art, but are a prominent feature. 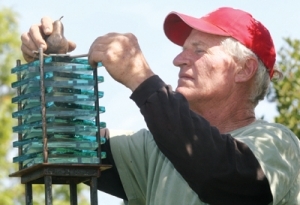 The pair have been working together for over 25 years. 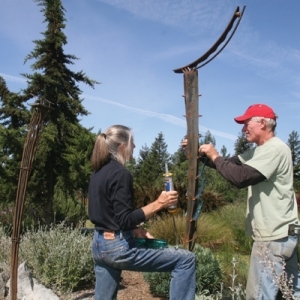 "Scott and Cristie's shared passion for architecture and construction, combined with their love for gardening and the outdoors, inspire their work," read the artists' statement, and Passages provides a landmark in their collaboration. 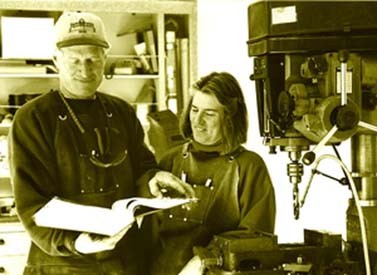 Scott and Cristie began working in collaboration in 1976. Their shared passion for architecture and construction, combined with their love for gardening and the outdoors inspire their work. Although they always have samples on hand, Cristie and Scott focus on custom design and build, doing all their own fabrication. Utilizing a variety of materials including steel, copper, bronze, concrete, and glass, they are known for using materials in unexpected combinations. The :L:M:N:O: Arts shop and design studio is situated on a ridge overlooking mountains, valleys and agricultural land. Cristie and Scott maintain extensive grounds surrounding their workspaces. They are open to the public each October through the Cultural Council of Santa Cruz County's Open Studios Tour. Choose from :L:M:N:O:'s designs, work from your designs, or allow Scott and Cristie to create something especially for you.